Gary has accepted the role of Chief Executive Officer at the Central Coast Council and he and his wife Michelle will be relocating in six weeks. Lismore Mayor Isaac Smith thanked Gary for his valuable contribution to the organisation and the community. “We have been privileged to have such a high calibre General Manager with us for the last seven years,” he said. 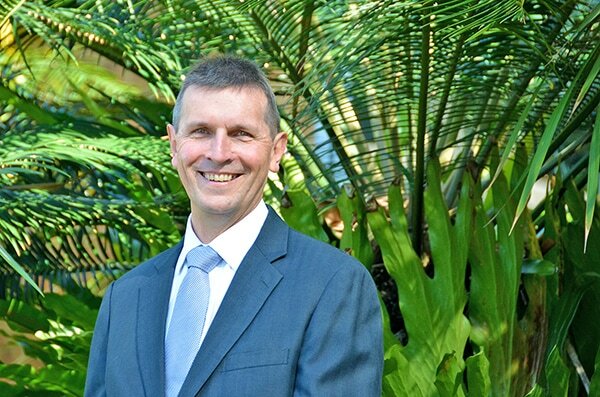 “Under Gary’s management, Council has become a nationally recognised leader in waste management and recycling; he has implemented an innovative floating solar farm; set bold goals around self-generating 100% of our electricity from renewable sources by 2023; and delivered the Quad and art gallery; health precinct; and the Lismore Prospectus. His leadership and support during the 2017 flood helped the community and staff maintain resilience during a particularly difficult time. Gary said he has loved his time in Lismore both personally and professionally, but was looking forward to a new challenge. “I have been General Manager for seven years and my plan was always to do a maximum of 10 years. Timeframes and opportunities do not always coincide and I have always seized opportunities as they arise,” he said. “The Central Coast Council role is an exciting challenge for me. It is a newly merged council with 2400 staff, a population of 335,000 and a budget of $723 million and $6.9 billion in assets. “The Northern Rivers, and Lismore in particular, has been very good to me and my family. We have been warmly received, made some wonderful friends and will treasure the times we had here. Council will recruit an Acting General Manager in coming weeks to take the reins from 15 June until a new General Manager is appointed. In the meantime, Mayor Smith highlighted that work continues as normal for Lismore City Council. “We have an ambitious four-year Delivery Program and are focused on delivering fantastic results for our community,” he said. Image: Lismore City Council General Manager Gary Murphy.